Celebrate Earth Day with six apps that will help you take a step towards going green and becoming more aware of conservation. Whether you choose to get organized with My Recycle List or pledge to participate in a Billion Acts of Green it’s possible to find inspiration here. 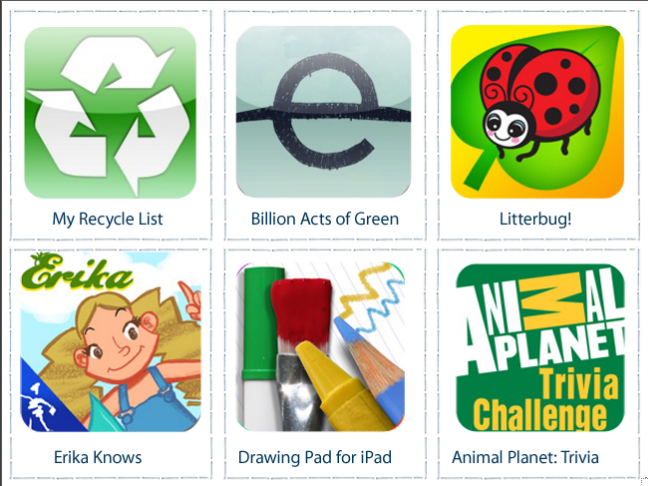 Children can look to an ebook about Water Conservation or a game that teaches the value of recycling our litter. As a family you can take steps to reduce paper waste and “go green” with the Drawing Pad app for the iPad. Finally, why not spend Earth Day getting to know her other inhabitants by playing the Animal Planet: Trivia Challenge? Heather is a wife and mom of two living in the great state of Texas. She loves to work with children and spend time with her family. Heather loves to write about family, frugality and parenthood. When she was a little girl, her mother always told her that one day she would be a writer. She planned to be an actress, a teacher AND a lawyer but told her mom she would never, ever, be a writer. Fast forward 20 or so years, and the biggest lesson Heather has learned is that your mom is always right. Heather started using coupons and shopping sales to save her family money and it caught the interest of everyone around her. To keep from repeating the same thing over and over again, she started a blog to share her love of great deals and fun, frugal living. You can find her blogging at Family Friendly Frugality and over at A Southern Mom. Heather is delighted to help others shop smart and spend wisely.